If you think you are a creative culinary chef and starting to starting to get an itch to in wanting to be the head chef in a kitchen. You probably will get the followings popped in your mind kitchen: you have work the grind of the industry in thinking you have paid their dues, wanting to be one that get noticed for the dishes that are created on the menu each and every night, and most of all you felt the "need to move on to new challenges". Of course those are fair assertions and assessments that are being thought out loud, but how can those chefs go about in showcasing their talents? It's not as easy like the other jobs in uploading resumes to Monster.com . You can tried to open a new restaurant, which required a lot of money and closure rate will work against you in a short amount of time. Probably send out audition tapes of yourself to join a reality TV show in a cooking competition. Be warned... you will need to sell yourself just to get to the contestant row on "Price is Right". They don't always look for the most talented chef, but also looking for ones that are "good" for TV. If you can cook and bring drama with your egotistical personality, you might be considered (so I'm told). However, there is a better way these days. One of the few phenomenon that was happening in Los Angeles the past few years for the up and coming chefs to showcase their talent is through the pop-up channels. Which for one day or maybe a limited time engagements, a chef will come to a kitchen of a restaurant space to showcase their dishes. One of the earliest pop-ups I ever attended was the Hatchi series that was presented at The Bread Bar in Century City. 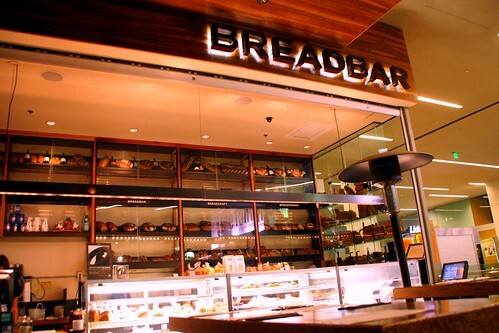 On day time, it's a full restaurant like anywhere else, but at night time of the said event, the Bread Bar's kitchen will gave way to the featured chef of the night. This was one of my favorite only because it's not full tasting menu where you can choose the numbers of dishes you wanted at a cost of $8 for each plate. At this monthly event, it usually featured an upstart, maybe a seasoned veteran in the industry that is letting people know he is available, or even a recent celeb chef that wanted to go in a different course and wanted to test out his new cuisine for his/her fans. At this particular dinner, we were treated to dishes created by a former personal chef to the stars, Roberto Cortez. This international cuisine chef has very impressive lists of clients he had catered to and also had a very extensive culinary training background in five different countries. If you googled his name with the word "chef", you'll probably be impressed by the name of the celebrities he had served to. The theme of the dinner prepared by Chef Cortez this particular evening was called "Unfamiliar Conflict". It was aptly named for the combination of different flavor profile that is served in each of the course. For instance, the above Smoked Shitake Terrine was an interesting contrast to this lively tasting. The white corn velouté is in sweet richer flavor profile while the terrine is in a bitter savory taste that is giving a tug and war pull of flavor contest. Many of the dishes presented were offering a beyond the boundary approach considering the training background of the chef who has European and Latin cuisines in his repertoire. Asian components with Latin flavors mixed with European influences are some of the discoveries that were made. The dish that exposes that type of techniques were evident in the "Veal Short Ribs" and "Lemon Lacquered Chicken." Both dishes offered succulent take on otherwise familiar dishes that served in many upscale restaurants. Chef Cortez's unfamiliar conflict can be considered in the realms of avant garde in the culinary field for its bold take on unconventional flavors matching. At the night, I think the desserts were probably the ones that get the most applause in our table even though I think the main courses were the ones that are the hardest to prepare and get my approvals. I think the Manjari Chocolate Cream dessert bowl with tiny pearls and cherries was probably the highlight for any of the desserts we ever had in any of the Hatchi series. The Valrhona chocolate that served in the bowl was divine and absolutely decadent. I think overall that if this was an audition for chef Cortez to impress his future scouts or gather new fans, he would have passed with flying colors. It's too bad on that they haven't continued the Hatchi series in a long time. Considering I had been out for a while, this event had taken place over a year ago, but yet still etched in my mind on what creativity it can bestowed upon if an up-and-coming chefs get to display his craft like Roberto Cortez had once did. Alas the series is not active at this moment nor do Bread Bar is having a schedule event since middle of last season. There are few other pop-up series that are spreading around various part of Los Angeles. If there is ever a good route to go for a chef that is looking to make a name for themselves, these type of events would be a good "instant" course of action. Great photos! Wow! Did you get a new camera? A post 1.5 years in the making! Hey Weezy! Thank you very much! Not so much of a new camera, but a brand new monitor. Now I can see the calibration of color differences and the contrast much better on the new screen. That veal dish looks extraordinary. And that chicken..yum. But I have to admit that the lemon curd and chocolate cream are my favorite. Well, generally, my favorite part of the meal is the dessert. And these treats are so mouth-watering. Thanks for sharing. Wow, just found your post now, haha, it's great.. I have a dining group in L.A now called CR8. Would be great to see you at one of my next dinners.